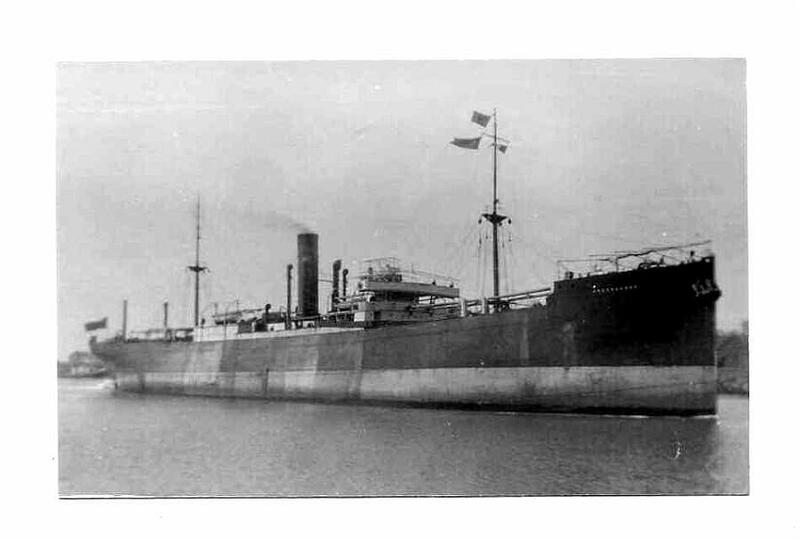 Meanwhile the Italian passenger liner, SS LEONADOD DA VINCE, was reported standing by the stricken AMBASSADOR. The “Ambassador” was transmitting on emergency batteries, since the engine room was flooded, and her signals grew progressively weaker. Finally the radio operator said that he too was abandoning. As the distress case progressed, ships of all nationalities and in various locations, some even several hundreds of miles away called and offered their help. COOS BAY arrived the morning of 19th February to find several merchant ships standing by the stricken freighter. The wind was very strong and the seas were running high. Even the large ships were yawing wildly back and forth. On the scene were the Italian passenger liner VULCANIA, and the French merchant ship CARAIBE, the American ship CITY OF ALMA, and the Norwegian ship FRUEN. United States Air Force and Coast Guard and Canadian aircraft had been searching since the previous day for liferafts and survivors. Just before COOS BAY arrived on the scene she recovered a deflated life-raft sighted by one of the look-outs. The FRUEN was laying about 200 yards to leeward of the AMBASSADOR and had thrown a line-throwing gun to the stricken freighter just as GOOS BAY had arrived. Five men had already been taken off by FRUEN however there were still sixteen men on board the AMBASSADOR. The previous day, most of the crew of 35 had taken to the liferafts. The port lifeboat of the AMBASSADOR had been crushed by the seas and the heavy port list prevented the starboard boat from being launched. The operator had radioed the previous day that they didn’t think the ship would last another eight hours.. The first crewman to reach FRUEN told of how two of the rafts had upset almost immediately near the ship and that fourteen men had been lost. They said that three men had been seen drifting away in a small raft. Twenty one of the men in the rafts made it back on board the AMBASSADOR and spent the night huddled in the lee of the bulwarks on the bow of the steeply listing ship. Since the FRUEN had a line fast on the AMBASSADOR, COOS BAY stood by and directed the various merchant ships and aircraft to search the different areas of possible drift of the liferafts. The odds were heavily against finding anyone alive by this time because of the weather and the fact that two of the first liferafts had upset, nevertheless, the search went on. Over the space of the next two hours four more men made it across to FRUEN on the long line. The waves were breaking over their heads and often they would disappear from sight. The first line that FRUEN put aboard the wreck snapped after a while, as did the second but a few men got off each time. When a total of nine men had been removed, the third line also parted and FRUEN radioed that she had no more lines to put out. The radio operator was a woman and the COOS BAY had considerable difficulty understanding her accent until fortunately, the Master of the Dutch salvage tug ELBE cut in and offered to translate and relay messages. The ELBE was still a hundred miles away and was coming in to attempt to tow the derelict into port should she remain afloat. Although FRUEN was out of rescue equipment and was several days late on her voyage, she remained on the scene while COOS BAY attempted to remove the crew, FRUEN then stood off to windward to watch. seamanship in manoeuvring such a large vessel in the vicinity of a foundering wreck and successfully putting a line aboard three times. Fortunately the two ships drifted about the same rate, making the operation possible. COOS BAY manoeuvred her bow close to the bow of the AMBASSADOR and fired a line-throwing gun. The first shot was true and the crewman of the AMBASSADOR pulled the line aboard. COOS BAY, being a lighter draft ship with a lot of superstructure to resist the wind, drifted to leeward faster than the wreck. Thus it was readily apparent that the rescue operation was not going to be a snap. The men on the wreck hauled away as rapidly as they could and soon a fifteen-man rubber life-raft was on the way. The seas were not as steep as on the previous day, yet they were still about 25 feet high with the tops breaking and blowing spume in the 40 knot wind. COOS BAY rolled heavily 20 to 30 degrees with all hands hanging onto whatever they could. Launching of the ships boats was out of the question. The rubber life raft seemed the men’s best chance for getting off. COOS BAY drifted away as the men hesitated to board the bouncing craft. Finally five men jumped towards the stern of the ship. Look-outs were immediately alerted to “keep those men in sight at all costs” Again a wave surged over the raft and the remaining two men went overboard. COOS BAY immediately got underway at best speed to get the first man who had drifted farthest from the ship upwind. It was hoped that the crewman still aboard the AMBASSADOR would help the other men back aboard who were still floating near the ship. Within minutes the COOS BAY was alongside the man who now was 500 feet to windward. A standard ship pick-up (as practiced in Man-Overboard Drill) was made and swimmers with lifelines went into the water to help the up the embarkation net. The first man was exhausted but required no treatment. Then the loo-outs spotted another man drifting under the stern of the AMBASSADOR. COOS BAY ran over close aboard and threw a line to him which he had just enough strength to grasp until he had been pulled a hundred feet clear of the ship. Then he too was brought aboard by the swimmers. These six men who volunteered for swimmer duty risked their lives many times before the day was out and were all recommended for commendation. The second man to come aboard required the service of the ship’s doctor who was ready on deck with a resuscitator. It was touch and go for a while but finally he was revived and by the following was up and about. Meanwhile COOS BAY steamed around to leeward of the wreck to see what had happened to the tree other men in the water. They were not in sight, however the life-raft was seen drifting off to windward. In the chance that they had been able to climb back aboard, FRUEN was asked to recover the raft. Since darkness was approaching, it was decided better to take COOS BAY right in close aboard the wreck, pass a line for the men to secure around themselves, and pull them aboard through the ward Gulf Stream water, one at a time. Since the ships drifted at different rates, COOS BAY could not lay close aboard long enough for more than one man to be hauled aboard. COOS BAY waited until the man had jumped into the water, then took a light strain on the line to pull him clear of the derelict’s bow while the man was being hauled alongside where the swimmers in their rubber wet-suits could help him aboard. As soon as one man was aboard, COOS BAY steamed around to make another approach, fire a line aboard, and repeat the operation. Since the life preservers worn by the first two men were observed to keep the man’s head above the water it was decided to send over COOS BAY jackets on the line. The jackets had a collar to protect the mans head. After two men had been recovered in the above manner, and since time was running out, it was decided to take them off two at a time on the line. Two jackets were sent over the next time. This worked well until the next to the last trip when there were four men remaining on the ship. Suddenly all four men were seen to jump overboard tied on the line and it was too late to try to stop them. The COOS BAY was drifting onto the wreck and nothing could be done but get them on board as quickly as possible. The first man on the line was seen to lose consciousness about mid-way and to go face down in the water. The other men were too far away to help him and there was nothing to do but haul them aboard as fast as possible, hoping that quickly applied resuscitation would save him. The line was leading through a block just above the embarkation net and there was no delay in hauling the first man quickly aboard. The doctor applied emergency measures even before he was cut loose from the line but it was too late. The other three men came aboard in good condition. COOS BAY then left the wreck under the observation of FRUEN who would warn passing ships of the unlighted derelict, and proceed to search for a life raft that had just been located by an aircraft 26 miles away. The plane dropped float lights to mark the spot and circled the area until COOS BAY arrived. The fully inflated raft was located floating upright by searchlights but no survivors were found. COOS BAY then steamed west to look for a light that had been reported by another aircraft. Although by this time the VULCANIA had by this time been dismissed to proceed on her voyage, she remained to search to this light until COOS BAY arrived. COOS BAY and various aircraft searched throughout the night and the flowing day without results. The weather was worsening and the search visibility was almost nil, therefore active search was discontinued late in the evening of the 20th pending further developments. The eleven survivors responded rapidly to treatment as the entire crew of COOS BAY pitched in to make them comfortable, outfit them with clothing and personal needs. By the next day they were all up and about the ship. During the night of the 20th and for the next couple of days they had a rough ride as COOS BAY fought her way back to port against 30 foot seas and winds gusting to 80 knots. In commending his crew, the Commanding Officer, COOS BAY said, among other things, “This was certainly an ALL HANDS effort” and he meant not only his own crew of whom he was justly proud, but also the crew of the aircraft who flew many hours low over the water in hazardous weather, and the Master and crew of the m.v. FRUEN and the other ships who actively participated in the search, all of whom lived up to the highest traditions of the sea and its brotherhood. A copy of the report which is reproduced here was presented to each of the survivors of the AMBASSADOR by the Author of the Report.. One of these survivors presented his copy to TASC Member George Wade; when George was employed by the Shipping Federation. We thank George for making it available to share on our website.